People ask, "Am I enjoying having the kids back in school?" Yes! I love them dearly, but it was a long summer, and the kids function so much better with structure. We've been highly structured and scheduled from day 1 out of necessity, so free time is actually harder for them to manage than a schedule. But having them back in school didn't start without a few bumps in the road. I'm pretty sure the school nurse has me on speed dial from last year as she called me frequently about the bumps and bruises that are typical for kindergartners on the playground. 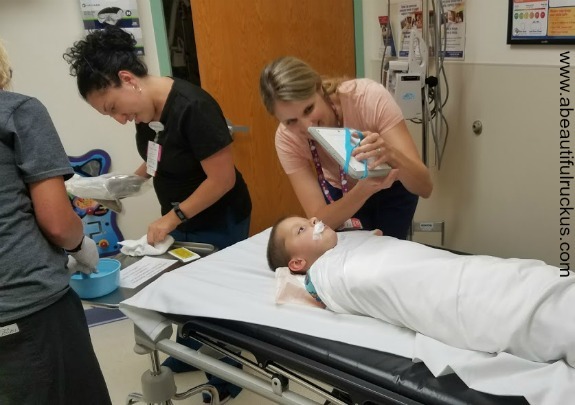 I assumed that those calls would lessen with each year, but it seems instead, we are just starting 1st grade with more time in the nurse's office. 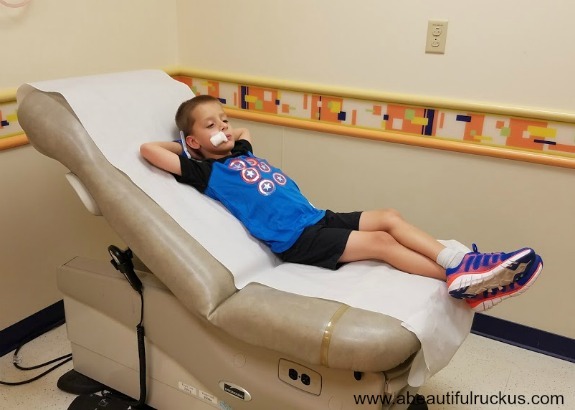 Halfway through day 2 of the school year, the nurse called to tell me that Caleb needed stitches in his lip for a collision sustained during PE. I guess the PE teacher had a white board and computer out in order to teach the kids what to do in case of a fire or other emergency (at least, that's what I think happened). Caleb was wearing his new "power shoes" that his Pa (Sean's dad) bought for him the week before school, and he "forgot to put his breaks on" as he was running, and he collided with the computer stand. 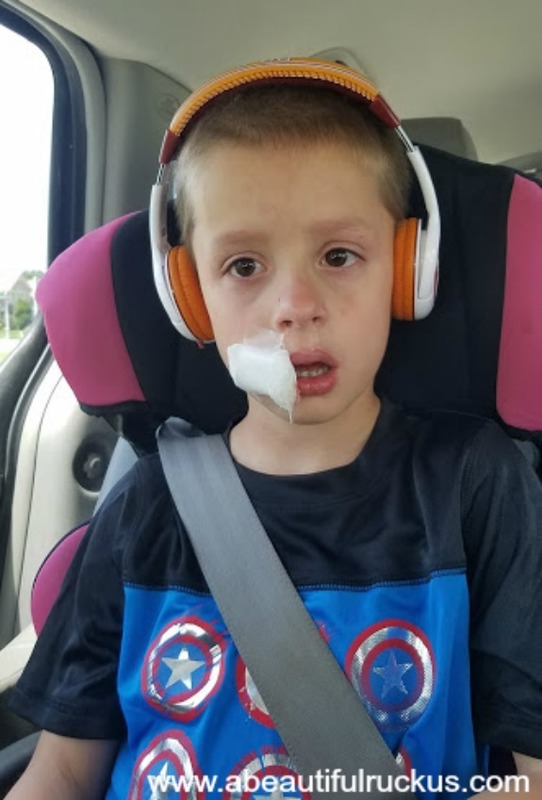 He split his lip open and it needed to be stitched back together. Poor kiddo. Any 6-year-old would be in pain and scared of the blood, but a 6-year-old kid with autism? It kind of puts it on another level. 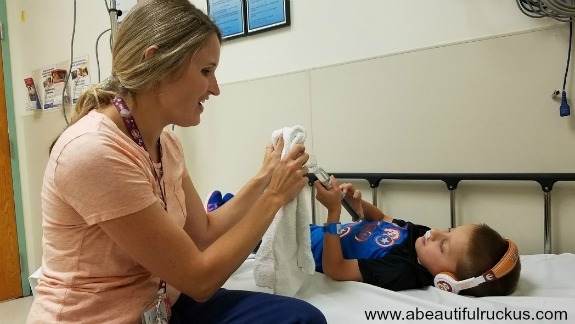 After signing him out of school, and confirming with the nurse that the best place to take him was Children's Mercy Urgent Care, we went to leave the school. As I reached for the door knob, everyone in the office suddenly told me to stop and wait while they radioed for clearance. I've been in and out of that school a bunch of times, and never had to get clearance after signing a kid out. But okay? It only took them a minute to get me permission to leave, and out we went. I didn't really think much of it beyond that. But about 10 minutes later, as I was at a stop light on the way to Urgent Care, a robo call came through to inform me that the school was on lockdown with all staff and students inside due to a threat in the area. I sat back in the driver's seat and said, "Are you kidding me?! ARE YOU KIDDING ME?! It's the second day of school!!!" And then I heard a little voice from the backseat, "Mama? What's wrong?" I looked in the backseat at my bleeding 6-year-old, and said, "....nothing. Nothing's wrong, Caleb." It's not like turning around and going back to the school was going to help him or the three others who were currently inside the building. So on I went...praying they would catch whatever the threat was, and that update would come through shortly. At Urgent Care, they got us right back. Thankfully, Caleb wasn't crying anymore at that point. 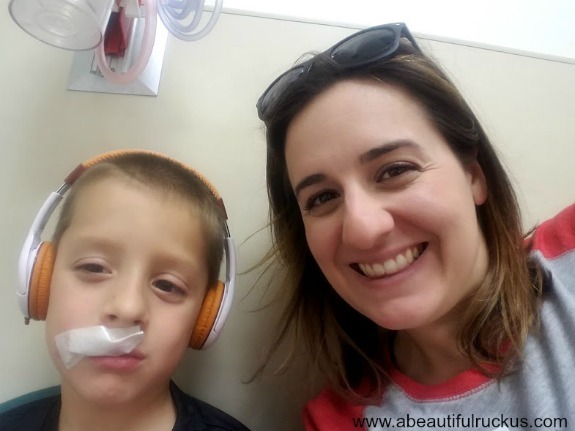 We went through registration, the triage room, vitals, and initial questions with the nurse. Then the doctor came in, looked at it, and said she couldn't stitch it because the wound crossed the lip border. If it wasn't lined back up perfectly, he would have some funny looking lips for the rest of his life. So off we went to the Children's Mercy Emergency Room. Poor kid. At this point, he just wanted to go home. After an unsuccessful attempt to stitch him up with only numbing cream, we finally had to partially sedate him to keep him from moving. It still took two nurses and myself holding him down while the doctor stitched and the Child Life Specialist held the tablet with the movie. We got it done though! In the interest of keeping his trauma to a minimum, we opted for two dissolvable stitches with 5-6 knots each vs. one regular stitch that would need to be removed a few days later. The doctor did a great job with that squirming/crying mass of a boy, and his lip was perfectly aligned. Even though he bit out two of the knots before we even left the hospital, the stitches stayed in and he has healed up nicely. I really hope that's the last of the dramatic school episodes for the year. Stitches and a lockdown all in one day is quite enough for me. Although, I found out after the fact that when the call went out from the school, two dads in our district went up to the school immediately and stood their ground directly in front of it to make sure nobody got in who didn't need to be there. It's good to know that there are people in our district who will go to bat for our staff and students if we can't be there...or if we are preoccupied with an emergency room run. And now I *totally* get to look forward to an urgent care and an emergency room bill. Parenting is some kind of expensive.